Even the network of the Wall Street barons, at some point, must admit that a disturbing imbalance in the gain and pain distribution is now the new standard for the economy. Recognizing that the worker has lost job security is undeniable. Talk of recruiting union membership without due paying contributions is just one illustration that the blue collier employee is becoming marginalized even more. Soon achieving employment, even in the most unskilled categories, will be an achievement in itself. People that work for wages are becoming disposable. Long gone are the prospects of benefits and retirement annuities. A job is being defined as a temporary internship that pays the minimum if at all. A healthy economy has always relied upon the velocity of money flowing quickly with the anticipation that once spent, the money can be replaced by new earnings. The consumer is hard pressed by rising food, energy and taxes that diminish disposable income with costs that far exceed the government rate of inflation. 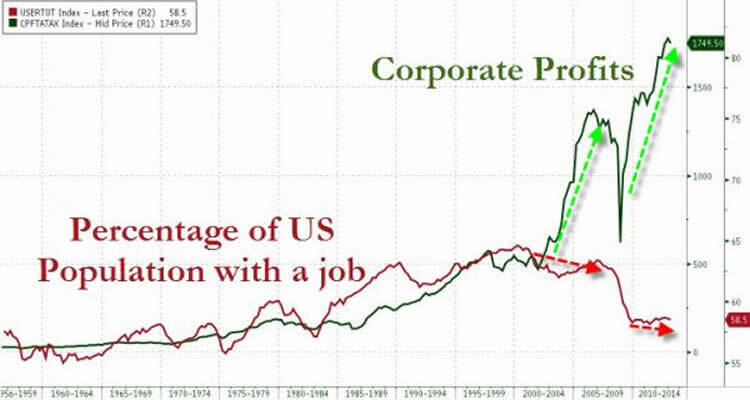 So when Santelli laments about the 30-year low in employment, the political class ducks for cover to place the blame elsewhere. The especially, taboo topic to avoid discussion is that of Free Trade. For the average small business entrepreneur, the overseas markets are beyond their ability to tap. Their products or services are predominantly local or national at best. However, the internationalization of trade is the primary market for most of the largest corporations. Trade by its nature is good commerce, when the benefits of such transactions, produce enhancements that exceeds mere profits. Making money on a business deal is not evil. However, allowing a corporatist business model to systematically monopolize and limit business transactions to a select group of like minded plutocrats, is at the heart of the disparity in shared wealth. Economic policy is designed to benefit the investment-banking sector. International banking does business with their crony counterparts among their corporate friends. The enormous accumulation of even greater assets by the superrich, while the 90 + percent underclass strive to maintain solvency, cannot sustain a viable economy. This dilemma is not primarily an economic unbalance because the marketplace has failed. No, just the opposite, the marketplace has been sabotaged. Government regulation really is contrived to eliminate the competition or prevent new contenders from growing so that the top tier conglomerates can increase their market share. Government policy is controlled by the moneychangers. The last thirty years has been a frightful employment environment for the average and aspiring employee. Off shoring affects not just the manufacturing industries. If a telemarketer service is cheaper in a foreign country, companies that make decisions solely on the bottom line often flee. Quantitative easing is best defined as unlimited near zero lending costs to cartel syndicates, while lending to non-cabal enterprises go wanting for capital at any cost. Here is the point that Santelli left unsaid. The employment side is no longer a free market of inexperienced labor or even trained employees to obtain work. To be hired for a paycheck has become a test. Since the government is the preferred employer, a loyalty examine is now a requirement in the application process. Even if the job seeker has no interest in becoming a government servant, the regulator requirements that private enterprise is forced to adhere to have become so ominous that the full time job that once existed has been reduced to a part time scale. Criticism from last week's Negotium article, Financial Meltdown Five Years After, centered upon providing a forum for the Government's version of the last five year "so called" recovery. Apologetically, for our deficiency in effectively rebutting the official account; however, this essay argues that the years since the financial meltdown are a continuation in the systematic dismantling of the American economy. Once upon a time individuals shared the success of corporate growth and earnings through equity in the company and dividends from profits. Today, insiders, hedge funds and counter party claims are the beneficiaries of stock ownership. Owning a stock in a specific company is touted as risky when you can buy an index. An annual shareholder meeting may need to endure disgruntled individuals, but their board decisions seldom consider the best interests of shareholders. This corporatist approach to exclude the insignificant and commune with the oligarchy class is meant to consolidate the privileged. Hording huge sums of company cash on a balance sheet is a sure sign that investing into a growing the economy is not a priority. Jobs are created when Capitalists instruct managers that the consumer will get a healthy infusing of cash to spend. Consumers need to increase their income significantly and have the confidence that such a boost in cash flow is not a fluke. When the money spigot only flows in the direction of the commercial banks and loans are limited for financing ventures that have significant employment creation potential, this practice is not by chance. As Rick Santelli implies, does this strategy sound rational? What is your response? How do you see the equation between the financial bailout and the lack of livable wage jobs? This argument is meant to describe the circumstances that lead us to the point where people are expendable, while the transnational global monopolists just gain more control.